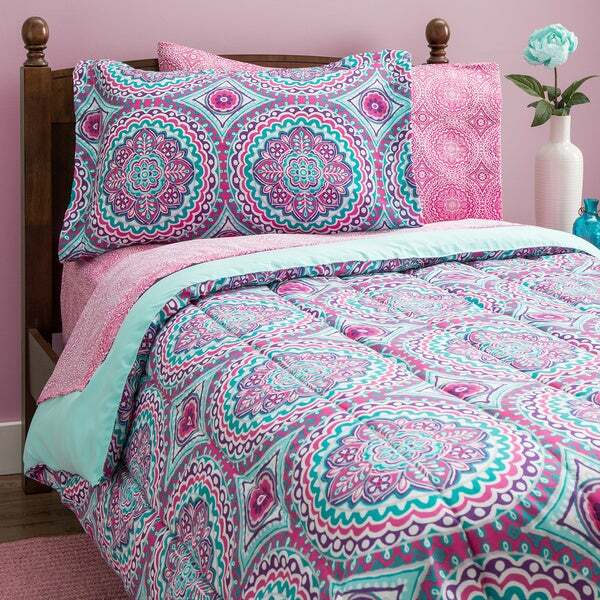 This bedding is bright and colorful and great for a teen ager or young adult. The quality is good for the price. It came with everything needed. Needed to be ironed quite a lot. This bold and bright bed in a bag set offers a painterly medallion print in two colorways including purple, pink, and turquoise blue or purple, pink, and orange. The set is made from soft microfiber fabric and is machine washable. The set includes an extra sheet set for added convenience, and the lightweight comforter is perfect for all-season use. Machine wash cold with similar color. Wash before 1st use. Gentle cycle. Do not bleach. Tumble dry. Use extra large capacity machines. Do not iron. Dimensions 20.0 In. X 19.0 In. X 8.0 In. The colors on this are gorgeous and I love that it comes w/ 2 sets of sheets. My only complaint is that the comforter is too short on the sides. If there was a way to buy a Queen comforter and Full sheets, that would be perfect. The Full comforter only hangs off the sides maybe 6 inches or so. I got this for my daughter. She loves purple and I wanted something bright that had other colors to coordinate with her room. The only thing I don't like is I wish it was a little longer on all sides. It's pretty short on her full size bed. I purchased this set for my 2 year old's new big girl room and we were very happy with the purchase. The comforter is not super thick, so it's great year round, but still very soft. The extra sheet set was definitely the selling point for me- especially with a toddler! Two sets of sheets alone could have cost the price paid for the whole set, so this is definitely a deal. We love the nice, bright colors and the 'Frozen-esqe' look it has too! Perfect for my little girl! I cannot believe a found a ELEVEN piece Bed-in-a-Bag for such a wonderful price!!! My step daughter will be going off to college this Fall, so for Christmas this year she has asked for items that she will be able to use at school. I ordered this Thalia Purple Medallion Microfiber 11 piece Bed-in-a-Bag for her dorm room. This set comes with everything she will need. I am especially impressed with the fact that it has an extra sheet and pillow set that she could use. I know from experience that when you have one sheet set, busy college students will delay changing their sheets if they know they will have to find a laundry mat, take them, wash them, dry them, bring them back to the dorm, and dress the bed. But, since she has 2 sets, she will be able to change her sheets and not worry about getting everything washed, dried, and returned to her room before bedtime. She has the luxury of letting it sit in her laundry bag for as long as she wants while enjoying fresh clean sheets already on her bed. The pattern is such a cute, ,funky, bo-ho print, too. Everyone who has seen it has complemented her on it. The colors are nice and bright but other than that? A complete waste of money. The quality of the fabric? Awful. The quality of the craftsmanship? Nonexistent. Also the size of the comforter? Not accurate. The comforter is about 30% smaller than the measurements listed on the website. I ordered 2 of these sets for my 8 year old daughter's bunk beds. The pattern is beautiful. Girly, without being overly pink. The sheets are not a great quality, but my 8 year old doesn't know the difference. With 2 sets of sheets in each set, and with the price that I paid, I am pleased. They work fine, and they wash well. I've washed the comforter a few times, and the color hasn't bled. It continues to look just as it did when I received it. My 4 and 6 year old granddaughters share a bedroom and they wanted mawmaw to get them new comforters which posed a challenge. One requested pink, she wanted all different shades of pink and the other one only wanted teal. My daughter in law requested bright and colorful and my son said do not spend a fortune. This bed in a bag set met all their criteria and made everyone very happy. It was a great deal with the 2 sets of sheets included and this set is of very good quality.The colors that were requested were covered and it is so bright and colorful. Made two little girls happy and should last a long time. Bought this set for my 8 year old daughter and she loves it. Matches her purple and pink room color scheme perfectly. I love the fact that it has 2 sets of sheets also! Excellent set! Soft sheets. Look great in my granddaughter's room. I love the fact that this set includes an extra sheet set since she has a trundle bed. Soft & cozy. Colors are bright. Great quality. 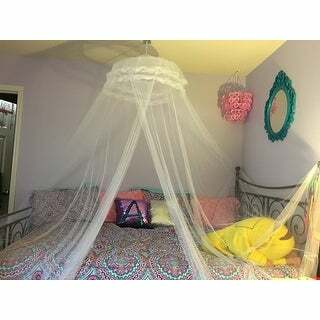 My 8-year old daughter was done with princess bedding and decorations so we picked this. It's bright and fun and more grown-up. I think the quality of the comforter is a little less than expected. Nice that it came with 2 sets of sheets. the comforter is nice. the sheets are kind of thin but overall it is very nice, especially for the price. I would recommend it for a friend. This bedding set was perfect for my twins’ new room! It has both their favorite colors! They chose to mix and match the sheets sets to make the look their own! This has been a great set for my daughter. Lots of colors to match with! Lovely bedspread, vivid colors and a perfect fit for my granddaughter's bed. Beautiful colors nice and comfy for my little one. I got this for an extra set and it is now her favorite. "Will you be getting this set in a full size back in stock? " "Are both of the sets of sheets the same color or do you get one set of each color?" You get one set of each color. It was pretty. I think my daughter will like it. Chosen for my daughter as a birthday gift. I like that it comes with extra sheets/pillowcases, as she has a trundle bed, and now they can match. My daughter loves these colors..